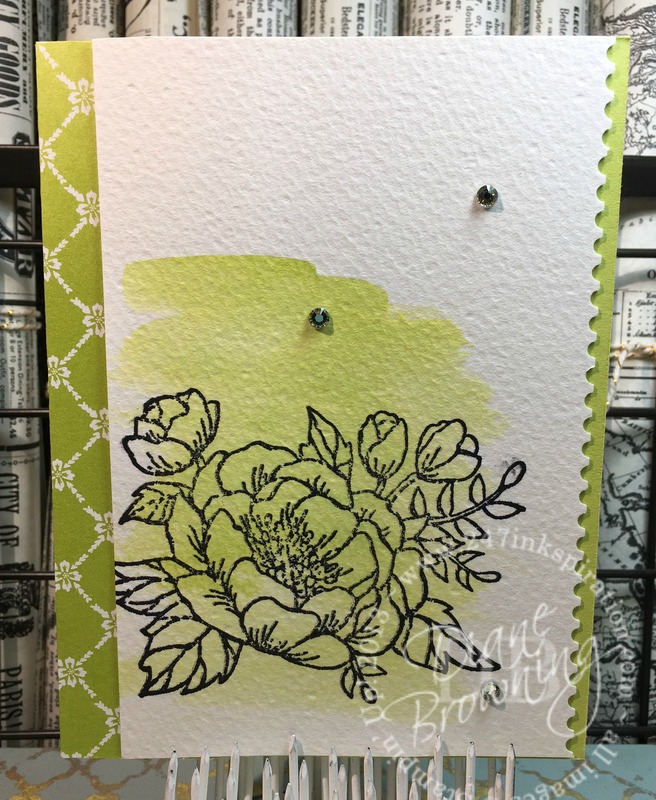 I have a selection of cards for you today for Five Minute Friday using the brand new In Colors that will be released next week. Actually, it’s one card in five different colors. This card is really simple to put together. You’ll want to do a watercolor wash on the watercolor paper. The more water you use, the lighter your ink color will be. 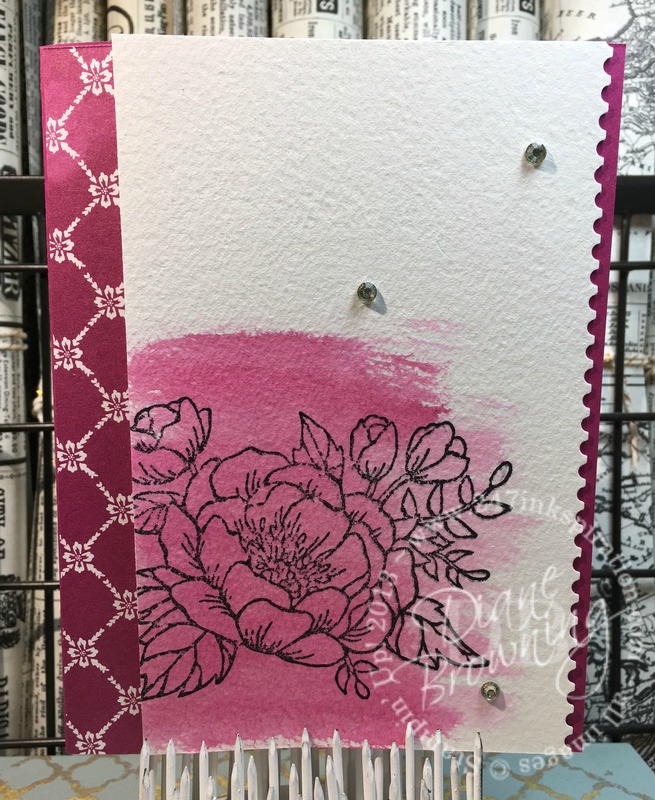 But, it will go one much smoother and you won’t get those harsh edges to the color wash. Once it dries, stamp the flower using Archival Ink. 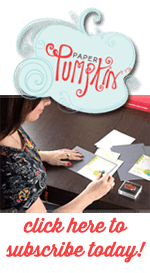 The rhinestones are added in a triangle formation on the front of the card. 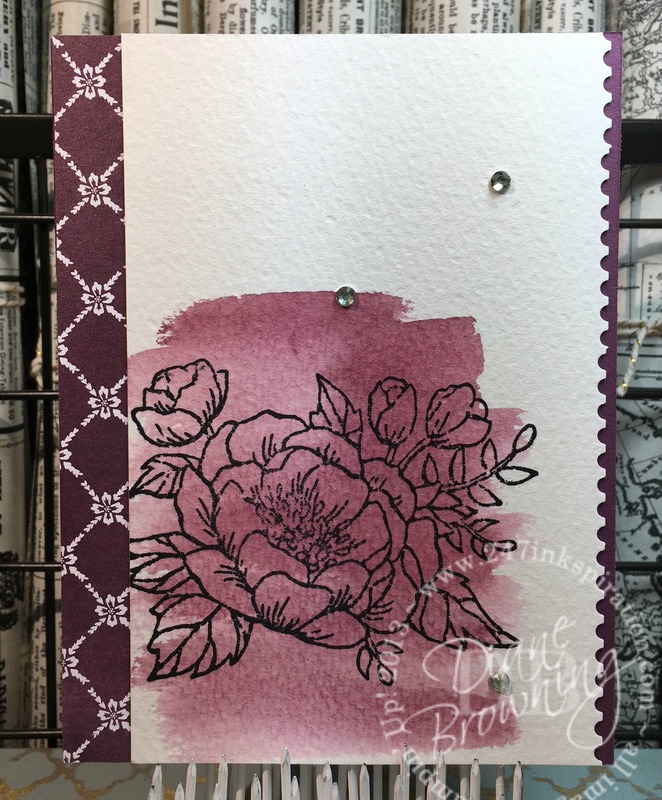 There is a small strip of the Fresh Florals Designer Series Paper on the left side below the watercolor paper. On the right, you’ll punch the edge using the Ticket Tear Border Punch. I left a small edge so you could see the color of card stock below the watercolor paper. Fresh Fig… And Lemon Lime Twist. Okay, honestly this Lemon Lime Twist is very bright. It’s not in my usual color pallet range. But, I love how the watercolor wash turned out. It’s still bright, but a bit more subtle. I’m sure I’ll learn to love it just like all the other colors. You probably noticed that I did not stamp any sort of sentiment on this card. Sometimes, there just isn’t place for it on the front of the card. And that’s okay. I’ll just stamp the sentiment on the inside once I know what I’ll be using the card for. LAST CHANCE: Oh my goodness, we are seriously in countdown mode now. There’s only five days left to get those retiring products. Seriously, shop now! Lots of items are already sold out. If you click on the Order Online button on the upper right-hand corner, it will take you to my online store so you can place your order immediately.